How did video solutions get so complicated? 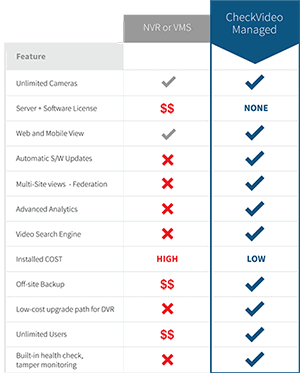 CheckVideo is a perfect combination of advanced analytics and Cloud-based video management, so you can have a security solution (or implement one for your customer) that is GOOD, FAST and CHEAP. Simple. Backed by 20 years of intelligent analytics R&D, and the complete security of SSL Labs A-rated video management, your solution is industrial-strength good. With the only on-site hardware being the camera or a gateway (for existing cameras) you can easily upgrade to IP and be operational in no time. Spend 30% less because the system is usually a single, intelligent device connected to the Cloud. And, there is no other hardware or software needed…ever. No matter if you are a security integrator, monitoring provider, business operations director or industry end user of video solutions, there’s actually much more to CheckVideo than SIMPLICITY. Begin your journey (form at right); we will respond within one business day.